I love him so much since i saw his performance in wakaba no koro and ienakiko2. The first is in ienakiko2. I really cant recognize him. I just think that " wow he is so special" but i dont know that he was koichi! until i read the casting for ienakiko. He has a brilliant talent. He si a hard working in his career, and he is also nice to his fans. I can see it from his habit in each concert. Stay happy and Good Luck always for Koichi!! Co-partner of Doumoto Tsuyoshi in the duo, KinKi Kids, I hadn't really apreciated his acting until [Rookie] where he really brought out the character of Aida-kun. Later I watched [Tenshi ga Kieta Machi] and also [Remote] which convinced me that while he is not an unbeatable in the area of doramas as he is on stage in musicals, he deserves any viewer's thumbs up simply for his professionialism and efforts in acting. I don't think that he can act initially maybe because he always didn't manage to get a good script till I saw Remote and Rookie. Wow... I can see the funny and cool side of him in the both roles. He is a very professional performer at stage in musical drama (SHOCK) which gained my support to him as an artist. Other than that he danced well. Great job, Keep it up... Kouichi! Although our prince here has the prince look and a serious personality, but I personally thinks that he tends to perform better with cuter roles like he does in ROOKIE! and Sushi Ouji! People tend to say he acts like a woodblock, I do agree for some of the dramas that require a lot of emotions, but I must say he did really well for other dramas too. Love him. 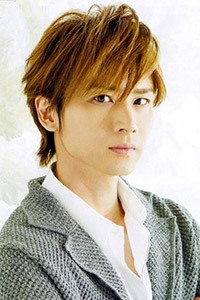 Domoto Koichi is so talented; music, acting, and performing in general. I first became fascinated with him upon watching a video of his first solo concert. Since then, I've had the opportunity to see his other concert, Endless Shock, and the drama Remote, and I've loved and been heavily impressed with what I've seen. I look forward to seeing more from him! Kochan is the BEST! No matter he is hosting, singing, dancing or acting. He put his BEST effort/performance to the audiences, to his fans and not forgetting to himself. He is serious in work, he love his work. He is funni too. Combining with Tsuyo-kun, they are the BEST (x n times) group! Ganbate Kochan! i shu ni oen suru! I like his role in 'Tenshi ga kieta machi'..maybe not everyone like that dorama...but I do like it alot...I'm also impressed with Ningen Shikkaku...though not the best,he could act like that at such a young age..I thought Ryuka was a difficult role..
Dohmoto Koichi , My second Fav. He is 1 Greeat Vocal with Tsuyoshi .. Love his SOLO songs too .. Acting are not as great as Tsuyoshi though .. But I saw REMOTE b4 , His Acting there have proved him to be a pro. seriously, he more better looking than the other domoto [gomen to tsuyoshi fans], though i havent seen him act, he is way cool dancer!!! Like him becos he is part of Kinki Kids, his drama are not bad also. Like his musical Shock. Real cool and stylish. One of my favourite artiste!! superior in his dance moves & stage plays.. koichi is so lovable..
one of the most underrated actors out there. He is so good that he makes what he does look natural. I really like his acting as the cool+mature Himuro in 'remote'. He was so kakkoii !! He's such a talented actor and singer plus he's really cute. other than he is handsome, he is so funnie and kawaii ! Handsome, responsible, Funny, and full of knowledge!! Love Kinki Kids, Love Koichi! Talented composer! He is so handsome & is a reponsible guy too..